Once upon a time not too long ago there was a little family in a little house on a little (desirable) street in Detroit. In it lived an aunt, a mother and an adult son. The son, we'll call him Sam, served our country in the Vietnam War. Unfortunately, he was injured and is now using a walker. He came home to his little house in Detroit and settled in the living room. At some point the aunt and the mother passed away. But he didn't much leave the living room. Sam had the good fortune of a house to live in. A house with no mortgage. All he had to do was pay the taxes. He did not pay the taxes. Wayne County sent him many letters suggesting he get on a payment plan. He did not get on a payment plan. Then they posted on his door that he was about to lose the house. Come get on a payment plan. The house was up for auction in 2016. We drove by and saw a lovely home on one of the prettiest streets and decided to buy it. Our daughter Molly house shopping with Pat. Then we met Sam. He was in the living room. We told Sam he could stay for free until we were ready to work on the house, but then he would have to move. Sam stayed for free until renovation time. But then Sam wouldn't move. Sam wouldn't even pay us ANYTHING to stay. We had to evict Sam. We felt like jerks evicting a war vet. Sam knew it was coming. But Sam did not prepare. The bailiff offered to arrange for him containers to move to a storage unit. Sam said no. The Bailiff said he'd better gather his most precious belongings then because it's time. Sam got up and grabbed his garbage bag full of marijuana. Then the bailiff called the Veteran's Association and was able to find Sam lodging with medical care. It took us SEVEN dumpsters to empty the house. 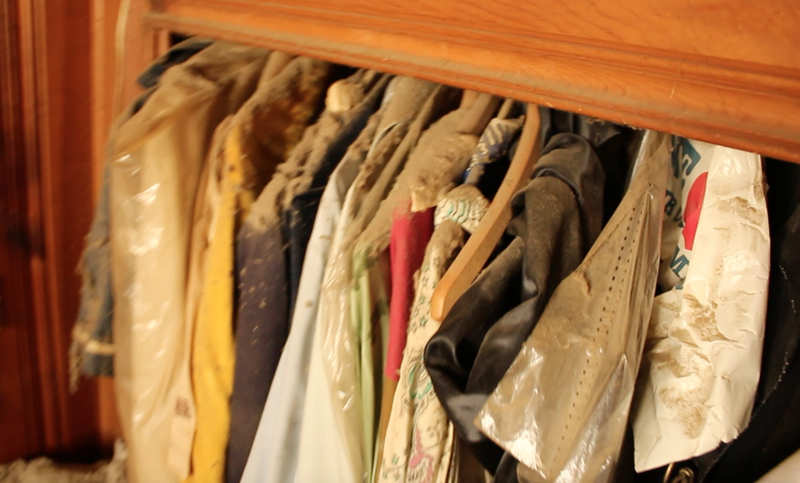 All his mother's and aunt's belongings were everywhere and covered in dust. In the end Sam thanked my husband and told him it was time for a fresh start. And now we have a beautiful house in our portfolio.